Even though this section only covers the XJ40, we have included some information on the later X300 and X308 as some prospective buyers may want to compare the various versions. For more detailed information on the later XJ, please visit the X300/X308 section. Speaking of warranty, in the US, if you are looking for a late model Jaguar you should consider a Select Edition model thru a Jaguar Dealer as these cars receive a 6 years / 100k miles warranty following a strict inspection. Prices can be a little higher than a car bought from a private party but the additional warranty and peace of mind is certainly worth the extra cost. As a factory warranty it is far superior with third party warranty contracts. Prices ( updated 11/01 ) are averages for cars with usual wear and mileage for each year, assuming no major problems. Prices will vary depending on location and other factors. For the UK, the prices listed here come from Classic Jaguar World price guides available right here on Jag-Lovers with all the details and variations; UK prices are listed for the 4.0 models, 3.2 versions are cheaper. The following guide was originally written by former webmaster Bill Weisman and was updated late 2001. Which model to buy ? HAVE ANY CAR YOU CONSIDER BLOWING YOUR WAD OF CASH ON CHECKED BY A JAGUAR MECHANIC THAT IS FAMILIAR WITH THE MODEL YOU ARE CONSIDERING! AND IT MUST HAVE SERVICE RECORDS! DO NOT TAKE IT TO SOMEONE WHO IS NOT EXTREMELY FAMILIAR WITH XJ40 or X300 VEHICLES! So.. uhh... now you realize that that's pretty important, eh? Well, clearly the model that you choose depends upon your budget, and this page does certainly have a North American slant to it (I have no idea whatsoever what a Daimler sells for in Australia..etc..) but this is important for everyone! 1) Early cars unless it is properly maintained and you take any flaw into account when making an offer especially for something like the Self Levelling Suspension ( see the 88/89 section below). Early XJ40s ( 88 and 89 ) do not have a good reputation but once sorted out can be nice reliable cars. 2) Don't buy the smaller engined cars. The 2.9L in particular is a real dog. This engine is very very prone to timing chain failure, and is very underpowered. While it cost less new, the car in actuality uses about as much fuel as the more powerful and durable 3.6L. Also avoid the 3.2, the mileage factor vs the 4.0L is a lot like the 2.9, but it's also a lot slower than the 4.0, might as well just got for the bigger engine, I mean, if you're that worried about mileage, why are you looking at a 4,000lb Luxury Car? The 3.2 is a well-engineered motor though. I just think that if you want a Jag, go for one with some "oomph"! 3) No Service History? No Sale. 4) Seller won't let you take it to a mechanic? He or She is probably hiding something. Dont bite. 5) Obvious problems? Don't buy one of these cars and think you can "fix it up". It ain't gonna happen. I mean, if you find expensive problems right off of the bat... Hell with it, it's also probably got a lot of things wrong with it that you CANT see. It will never pay to buy a dog and try fixing it. Unless you get like, a 1992 Sovereign with a bad head gasket, diff and rear suspension for like $ 4,000. Beyond the basic items and general things you'd check on any pre owned car, especially one over 10 or 12 years old, the Self Levelling Suspension is the major item to check. Many cars have now been converted to a standard shock and spring setup, something even Jaguar has recommended. If that's the case, this solves a major source of headaches. If the car still have the original SLS system in place, and even if it appears to be working and shows no obvious leaks, be prepared for an eventual failure which could come withing a few days... or years. The good news is that the conversion kit is readily available for under $ 500; official Jaguar install time is 2hrs for a trained mechanic and probably 5 to 6hrs in your own garage. See the XJ40 repair book for details. Note that some early XJ6 came with shocks and springs so no conversion are needed there. Another important thing to check or at least be aware of is the annoying failure of outside door handles, usually results of poor lubrication but also of a design flaw. Not a big problem, again this is covered in the XJ40 repair book. A/C and climate control can be one tough trouble spot on all the cars but more so on the early ones because of age... broken flaps, rotting foam, etc. It can be a pain to fix, but not expensive if you do the work yourself. Early cars had what's often called a digital dash, which in fact is very close to the later dash except for digital bar readout of the engine instruments and an additional digital readout of the speed. Of course regular mechanical checks must be done and it really pays to have a Jagaur specialist inspect the car. Rust is a big factor as it is often expensive to repair properly. On the bright side, the engine and transmission are nearly bullet proof unless showing signs of abuse, overheating, etc... The only weak spot of the AJ6 engine would be head gaskets failures which when caught early on are fairly easy to fix. Starting in 1990, the XJ40 series of cars was seriously overhauled. 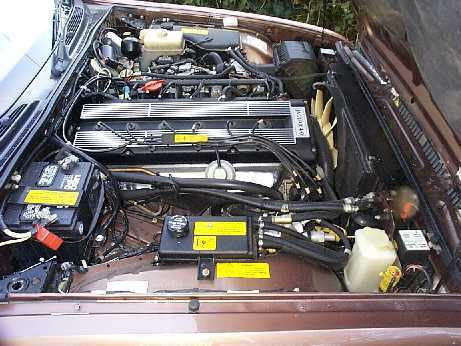 The 3.6L Engine was dropped in favor of the 4.0L engine. This gave the car not only a boost in HP to 223, but a massive boost in torque. The cars also gained a "switchable" automatic transmission with a "sport mode" switch enabling a higher-performance shift pattern. This is conveinient option for your teen-age son when he borrows your car (If you let a 16 yr old borrow your Jag, what do you expect?) Also, the cars found a heavily updated electrical system, lock and doorhandle system and gauges as some of the more noticeable improvments. The XJ6 continued, but without the self-levelling suspension, inlaid wood, full chrome window surrounds and sunroof to name a couple of items. 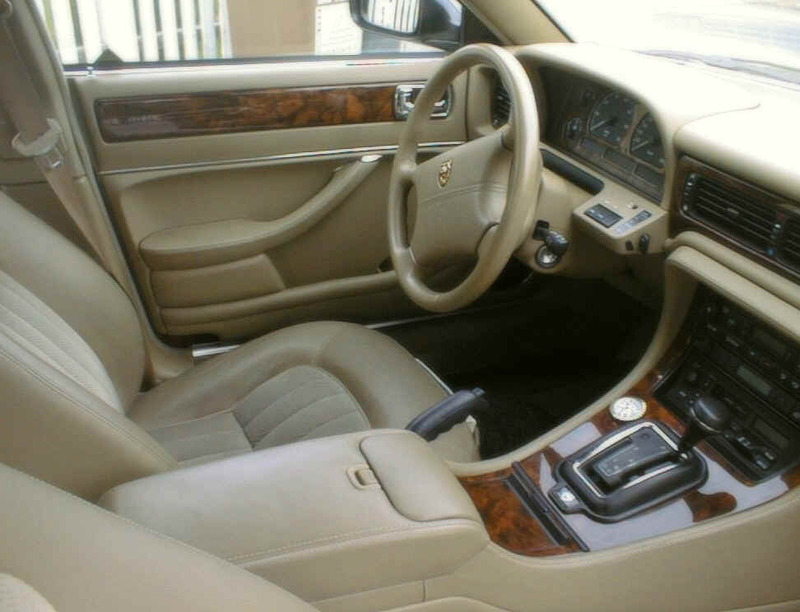 The 89 XJ6's equipment level was replaced by the Sovereign. The Sovereign, Vanden Plas and Vanden Plas Majestic all had the 1-piece headlights, which were new for the US this year. The model lineup continued without major, noticeable changes, into 1991. The Majestic took a break for 1991, to return for 1992. The 1991 and 1992 Jaguars continued to improve on quality and reliability as Ford's commitment to Jag started to really show. It should be noted that the 1990 and 1991 carswere already "done" by the time of the purchase by Ford and are still excellent cars. The best XJ40s are the newest XJ40s, the 1994s and the 1993s. The main advantage with the 94s and 93s is that they have airbags. The only real difference in the 1994 models is the addition of a passenger airbag and the switch to 16" wheels. The model lineup was also changed for the last two years of the XJ40's life : In the US the Sovereign and Vanden Plas Majestic were dropped. 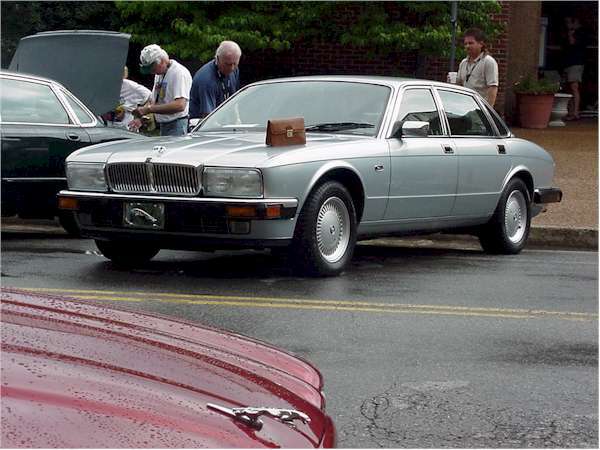 The XJ6 was given the one-piece headlights and was left alone with the Vanden Plas. In 1995 Jaguar totally revamped the XJ40 and now called it the X300. Well, actually, they called them XJ6s and Sovereigns and Daimlers, but inside the factory they called em X300s. These cars have totally proven themselves to be extremely reliable vehicles. 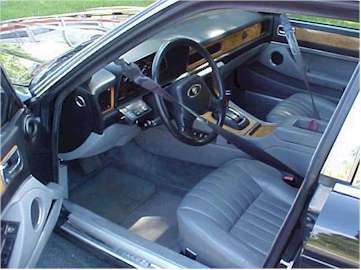 The X300 shares the basic structure and interior with the XJ40, but the body was redesigned and a long-wheelbase model was introduced as well. 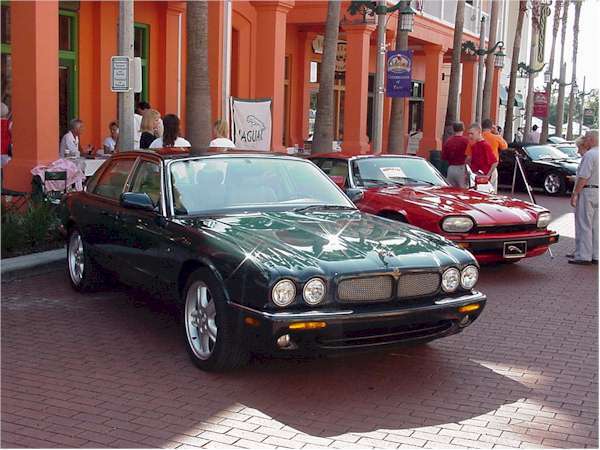 1995 was also the first year for the supercharged high performance XJR and 1996 for the longer wheelbase XJ6. The extensive redesign that took place in the X300 explains why they are much more reliable compared to the previous XJ6s; Jaguar had finally reached a level of reliability similar to its competition. For these cars, most problems reported on the Modern discussion list are minor and about some of the accessories such as leaky rearview mirror, memory problems in the power seats, and problems with the tilt steering wheel motor. Under the bonnet, the only thing which seem to come back on in a while are sticky throttle due to carbon buildup along with a few cracked exahust manifolds. Major engine or transmission problems are extremely rare if any. 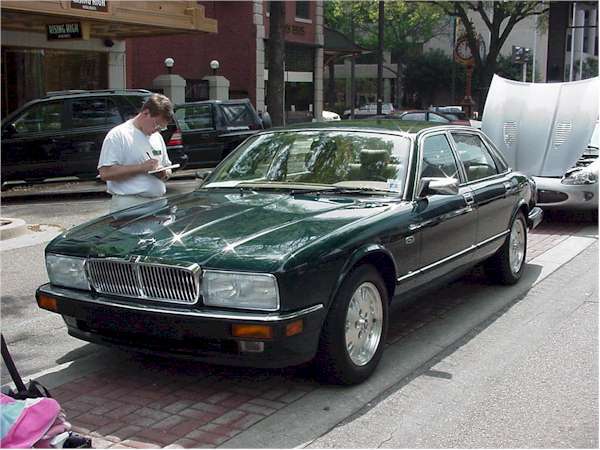 For the 1998 model year the XJ6 was no more, because Jaguar stopped making 6-cylinder engines in favor of an all new aluminum V8 which in its most common 4.0L form develops 290hp. Jaguar had first launched the V8 in the XK8 in 1997 so the engine was in it's second year when launched in the XJ8 and is very reliable and troublefree. The new V8 sedans have minor bumper and lighting changes as well as new seats and a new dashboard with the recessed round gauges. These cars now get better mileage, have a ton more power, especially the new supercharged 370hp XJR (picture left). Late model cars ( 4 years old or less ) can be purchased in the US from Jaguar dealers with the 6 year / 100k Select Edition warranty. The XJ8 seem to have very little significant problems as early models reach high mileage although two issues can potentially be very costly.